This Gluten Free Carrot Cake is a the same classic cake you remember, just without gluten and dairy. It’s full of carrot, coconut, walnuts, and pineapple which means it’s packed with flavor. Serve it for Easter and your guests won’t be disappointed. Carrot Cake has always been one of my favorite cakes and this gluten free carrot cake is no exception. This recipe is one that my family has been using for years, i.e. my whole life. 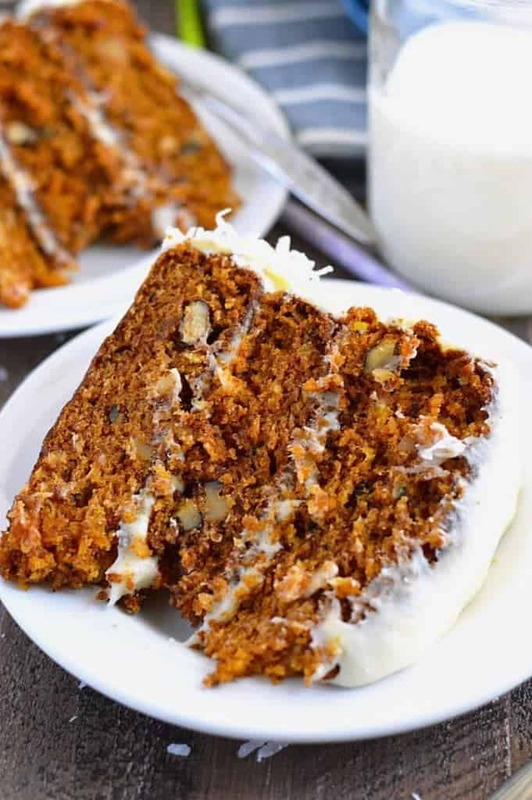 The original recipe was from The Silver Palate Cookbook and it’s one of those loaded carrot cakes – you know the ones with pineapple, nuts, AND coconut. It’s out of this world amazing. All that sweetness, texture, and yum all in one little cake. And when I say little, I don’t really mean it because it’s NOT a little cake like I usually make. This is a big, honking’, 3 layer cake that can easily feed a large Easter crowd. We used to enjoy the original version every year but my parents started making this cake gluten-free several years ago when my mom had to start eating gluten free. Now that Kelsey has to follow a lactose free diet, I decided that we could still enjoy this beauty of a cake. Just now it’s gluten free and dairy free beauty of a cake. And don’t worry about that frosting, it’s still got a gorgeously thin layer of dairy free cream cheese frosting that’s just as good, if not better, then the original. 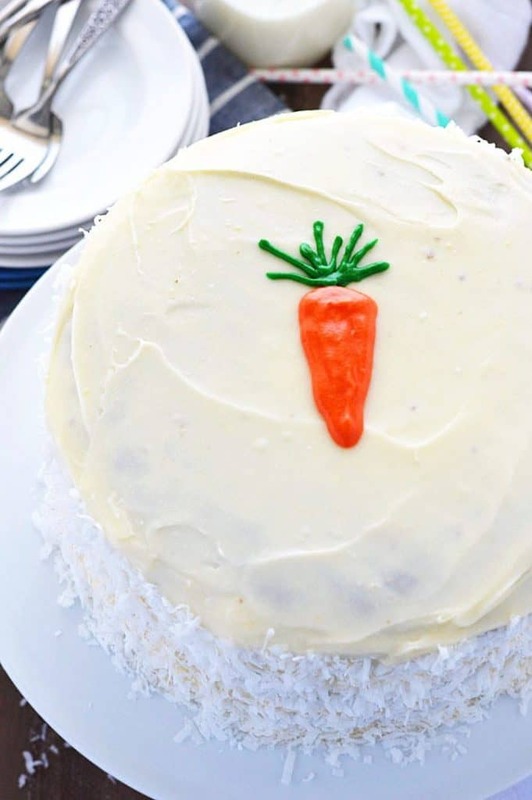 To make this carrot cake recipe gluten free, I used to make this with my white rice flour blend. This time, I used Bob’s Red Mill 1:1 Gluten Free Flour. Ladies and gentlemen, I’ll be the first to admit that I prefer this cake with the Bob’s Red Mill flour. I first used this flour with my frosted sugar cookies and I am really loving it. I used the same blend to turn this gluten free carrot cake into Gluten Free Carrot Cake Cupcakes. Works like a charm! 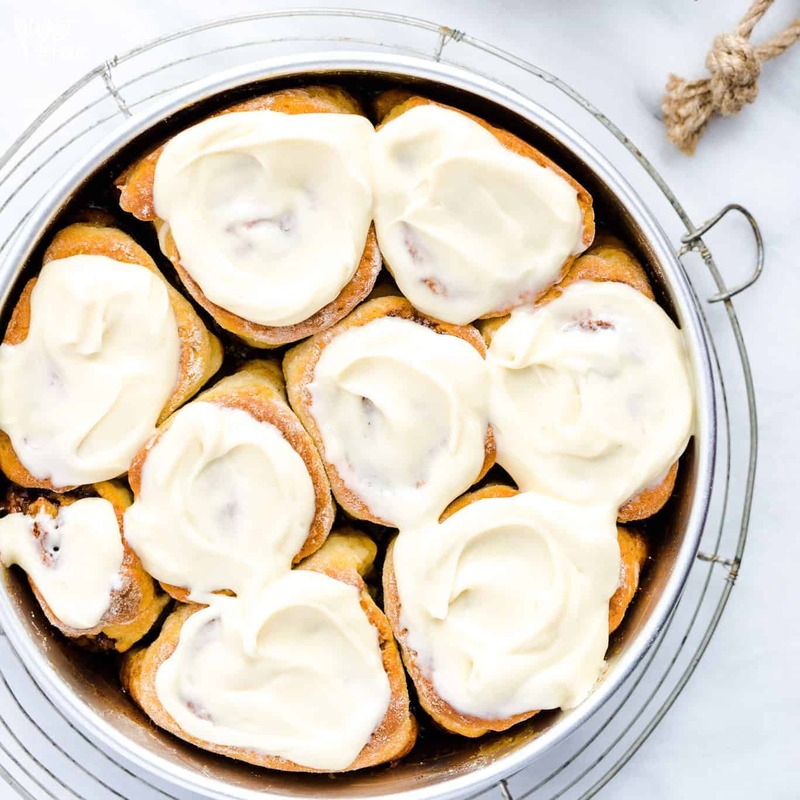 This gluten free carrot cake is an Easter dessert staple in our family – we make it every year and have been for as long as I can remember. 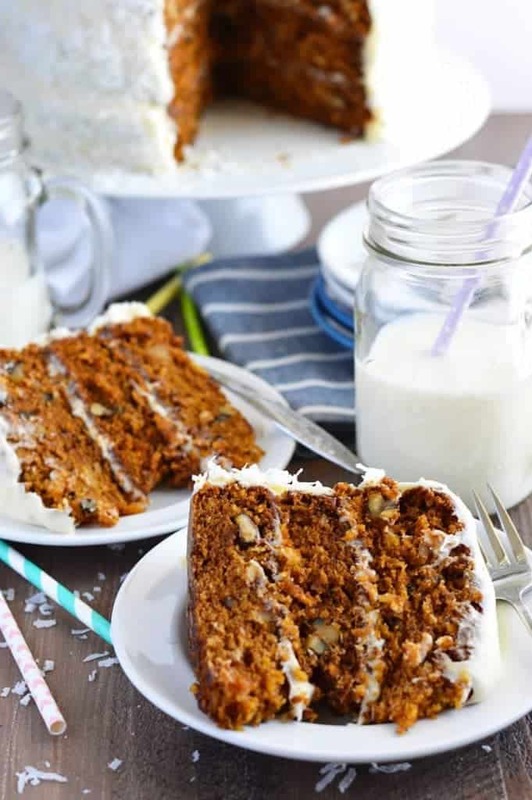 But if you’re looking for more gluten free desserts to add to your Easter menu, try this Grain Free Hummingbird Cake from Gluten Free Palate. Gluten Free Lemon Cupcakes or Gluten Free Lemon Squares would also be great additions. They’re all great spring dessert options that can feed a lot of people! Enjoy! This Gluten Free Carrot Cake is a the same classic cake you remember, just without gluten and dairy. It's full of carrot, coconut, walnuts, and pineapple which means it's packed with flavor. Serve it for Easter and your guests won't be disappointed. Preheat oven to 350 degrees and spray 3 9-inch cake pans with non-stick spray. In a large bowl, whisk together the flour, sugar, salt, baking soda, and cinnamon. Mix in the walnuts to coat them with the flour and set the bowl aside. In a medium bowl, lightly beat the eggs. Whisk in the oil, vanilla, and pureed carrots and mix until well combined. Pour the wet ingredients into the dry ingredients and gently mix until there isn't any dry flour. Fold in the coconut and crushed pineapple. Pour the batter evenly between the 3 cake pans. Bake on the center rack [see Note 3] for 50 minutes or until a cake tester comes out clean. Let the cakes cool for 15 minutes in the pans before inverting onto wire racks to cool. Cool completely before frosting. Add the cream cheese and shortening to a bowl of a stand mixer fitted with the paddle attachment. Beat together until smooth, about 1 minute. Scrape down the sides of the bowl and add the vegan butter. Beat about 30 seconds or until the butter is incorporated. Add the powdered sugar and mix on the lowest speed until the sugar is incorporated. Add the vanilla and lemon juice and mix an additional 30 seconds to 1 minute until the frosting is smooth and creamy. To frost the cakes, place one cake layer on a cake stand or flat plate. Add a thin layer of frosting, just enough to cover the cake, and spread it evenly over the cake. Add a second layer of cake and repeat the frosting step. Add the third layer and evenly spread the frosting over the top and around the sides of the cake. The cake can be kept at room temperature until ready to serve or it can be refrigerated. I suggest refrigerating the cake if your house is warmer then 70-72 degrees or it's humid. Bring the cake to room temperature before serving. 1. 1/2 C of regular, room temperature butter can be used in place of the shortening and vegan butter. You can also use 8 oz. 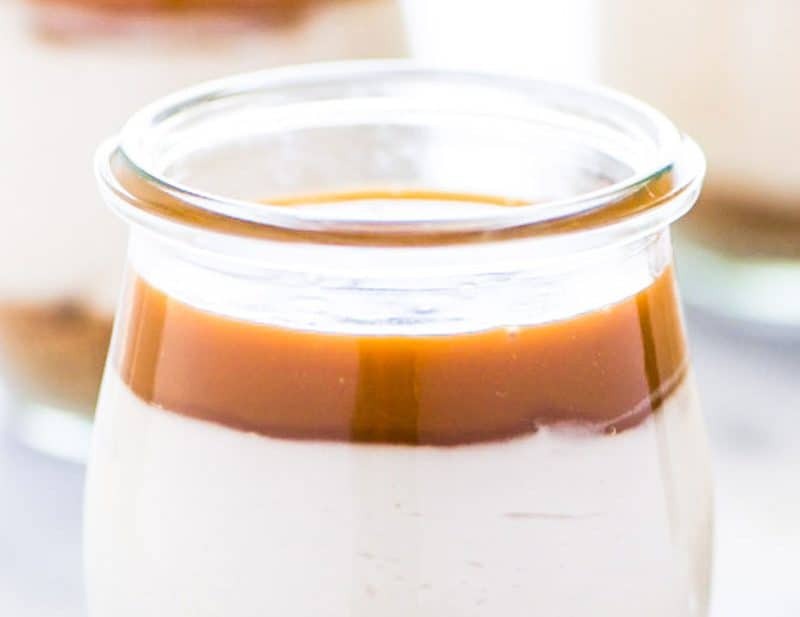 regular, room temperature cream cheese in place of the dairy free cream cheese. 2. The lemon juice will not make the cream cheese frosting taste like lemon. The acid helps cut the sweetness of the powdered sugar and really shouldn't be omitted. 3. If you can only fit two cake pans on your center rack, bake the 3rd pan on the bottom rack. If it needs to bake a few minutes longer then the other two cakes, move it to the center rack to finish baking when the other two cakes are removed. 4. 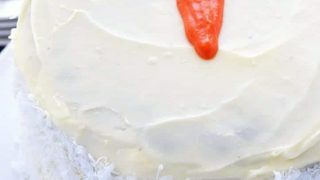 This frosting recipe makes enough frosting to have a very thin layer of frosting between each layer of cake and on the top and sides. If you want a thick layer of frosting, double the frosting recipe. I just saw this on Facebook and my mouth dropped to the floor… it’s freakin’ fabulous!!! I can’t get past the cuteness that is that little carrot on top! Also, I can’t believe this is GF! Looks great! I love carrot cakes with all the fixins! The more to it, the better. This looks amazing. What a beautiful cake! 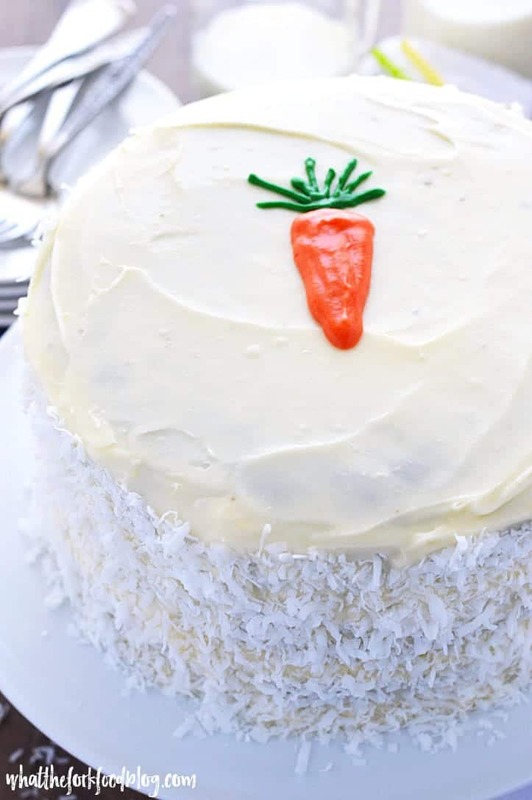 I’ve never used cooked carrots in my carrot cake, what a neat idea. I’m looking forward to making your version soon! I’d love a slice right now! This cake looks so delicious! This looks great! I actually had no idea how to make a carrot cake before this! Love the cute little carrot pic on top! Gorgeous cake Sharon! You nailed it gluten-free. It’s chock full of goodness and pass me a fork! I love the pineapple and coconut in the carrot cake! So much texture. Carrot cake has my heart! This one looks divine! Looks so moist and flavorful, I need a slice! I did have two questions: if I wanted to make this a two layer cake, by what amount would you suggest decreasing the ingredients. Secondly, would this still bake/turn out if I omitted the coconut? I would use 2/3 of all ingredients (but you could keep the frosting the same and have a little thicker layer) and you can omit the coconut if necessary. It doesn’t give the cake a coconut flavor but it gives it a nice texture. I feel stupid for asking this but where is the actual recipe? Not a stupid question at all – THANK YOU so much for bringing this to my attention. Somehow, it seemed to have disappeared and I’m looking into it. It’s back up now, thanks again for pointing it out to me! carrots in the recipe or should I stick to the recipe and cook and puree them? I would love to try this recipe but I’m not big on pineapple, can I just leave it out or would I need to add something in to replace it? Hi Lara, I wouldn’t just leave it out because it would affect the cake in a negative way. If you absolutely can’t do pineapple, you could try replacing it with an equal amount of shredded carrot. I have not tried this though so I can not guarantee good results. Oh my word this looks insanely delicious! Yum, yum, yum! Haven’t had carrot cake in forever. Thank you for sharing with us at Funtastic Friday! Hi Dina, I have not tried an egg replacement in this recipe but you could try flax eggs or the Bob’s Red Mill egg replacer. Let me know how it works out for you! I made this carrot cake for my Friendsgiving dinner party and it was absolutely fabulous. Everyone was going nuts about it. I’m really happy to hear that Amber! I hope you have a wonderful Thanksgiving! This looks AMAZING! 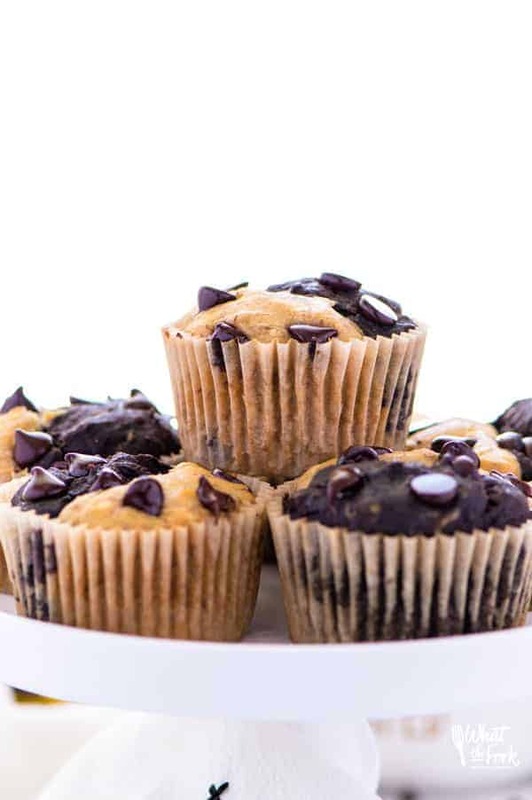 has anyone used this recipe for cupcakes? I would like the cupcake version also but don’t see a link? Thank you, the cake looks delicious! I made your cake for a friends Birthday, it was amazing, everyone was shocked it was GF, thank you gor the recipe. It will be my go to from now on. Thanks so much Judith, so glad you all loved it!